Britain's John Surtees has a rich history of motorcycle and automobile racing. Motorcycling World Champion, Surtees retired to cars in 1960. Driving for Ferrari in 1964, Surtees claimed the Formula 1 World Championship. My first impression was of the gruff V8 exhaust note. My second was of a car that immediately appealed. It felt very responsive both in handling and engine performance. Indeed, it had a level of comfort coupled with stability that made it feel rather special. In July of 1957, through Karl Heopner, the head of the BMW press department, Surtees received a metallic grey 507 with red/grey interior leather upholstery, with a major contribution coming from Count Agusta, of MV Agusta, for winning the 500cc World Motorcycle Championship. The car, chassis number 70067, is an early Series 2. The Series 2 cars had an updated dashboard and the rear bulkhead was moved rearward to provide more luggage space behind the seats. 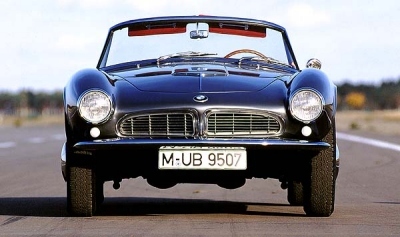 42 Series 1 and 210 Series 2 cars were built in the four years the 507 was in production. After about 10,000 miles,the car was specially modified for Surtees by BMW and Dunlop. 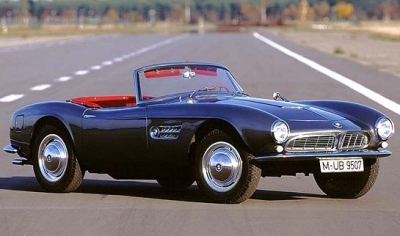 The car he had test driven at Hockenheim had been modified for more power, so BMW upgraded his car with Solex 36 NDIX carburators, a higher compression ratio, ported heads, and revised cam timing. Output increased from 140 bhp to 170 bhp, with a commensurate increase in torque. Later, Dunlop fitted the car with disk brakes on all four wheels as a test program for BMW. While actual braking power was not increased over the original Alfin drum brakes, with a top speed of 148 mph seen by Surtees on the autostrada between Gallarate and Milan, the increased fade resistance was appreciated. The suspension consists of double wishbones at the front, with adjustable torsion bars and an anti-roll bar, and a solid rear axle located by torsion bar links and a Panhard rod. Contributing to the supple ride and accurate handling is the fact that the suspension components were located by needle roller bearings, supplied with oil from a small reservoir at each corner. The car was considered to be a gran turismo and its long distance comfort, low noise levels, coupled with its forgiving handling certainly proved that impression. Surtees put about 48,000 miles on the car until, in 1963, he joined the Ferrari Formula 1 team. He succumed to the "pursuasion" of Enzo Ferrari and bought a 330GT. He kept the car and rarely used it, but it did not lie neglected. In 1981, the 507 was brought out of storage for restoration. However, the car was still in excellent mechanical condition, requiring only a repaint. The aluminum body resisted corrosion and the steel ladder-frame chassis was remarkably rust free. Since then, the car has been used sparingly, brought out only in fair weather. My 507 could fit whatever mood I was in at the time, whether rushing along country roads and mountain passes after a tiring day's racing, or just dawdling along taking in the scenery and listening to a piece of Greig on a tape. I've many fond memories of the times we've spent together.